Today I've launched a mobile version of ScriptureMenu.com! 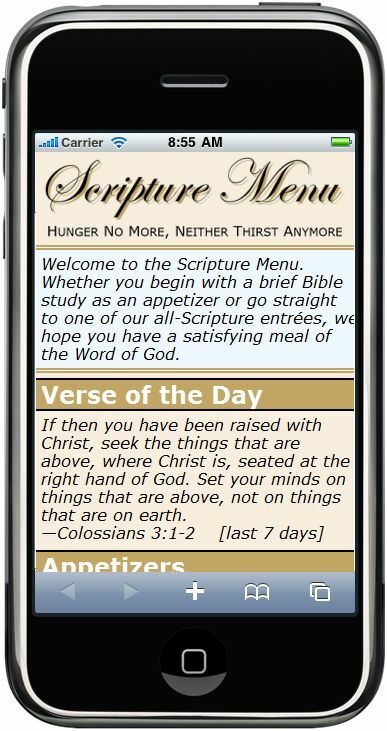 Just point your cell phone at http://ScriptureMenu.com and you should see the mobile version of the site. It contains the same information as the desktop version, but it is set up for convenient use via smartphones and most other Web-capable mobile phones. Let me know if you have any trouble with it, or if you have any suggestions! Last night in church my pastor taught on Colossians chapter 1, verses 1-6. As he was reading the passage, one thing in particular stood out to me. I guess I sometimes tend to try to figure out cause and effect when I'm reading the Bible, and in that few sentences I see the following causes and effects: first, the Gospel was bearing fruit and growing across the world. The people of Colossae heard the message, and they understood it, and it began to grow and bear fruit in them as well. One of the first fruits of this was the "hope of Heaven" in their hearts; once the hope of Heaven had taken hold inside of them, they began to have faith (confidence) in Christ Jesus, and also love for each other. Faith, hope, and love... just like in 1 Corinthians 13:13! It reminds me of the Parable of the Sower (Mark 4:2-9, Luke 8:5-8) where Jesus compared the Word of God to a seed which could grow and produce fruit under the right conditions. Obviously those conditions existed in Colossae, because the fruit was certainly happening! After church I was talking to a friend who is in the middle of a very rough time in his life. He has been having painful health problems, and he is having a difficult time financially as well. He sounded like he was having a hard time seeing the light at the end of the tunnel. I reminded him of a story in 2 Kings 6:24-7:20 in which the salvation of God comes suddenly and unexpectedly. The capitol city of Israel, Samaria, was under siege, and food was running so low that people were resorting to incredibly desperate measures just to stay alive. Some men with a deadly, contagious skin disease who were just outside the city had an idea. They knew their options were to starve where they were, to go into the city and probably starve there, or to go into the enemy camp and see if the enemy would give them some food, so they decided to go to the enemy camp and take their chances. But God had miraculously scared the entire enemy army away, and the diseased men had everything they wanted! When they went back to the city and told the people, suddenly the entire situation went from famine to feasting as they plundered the camp of their enemy. God had turned things around in less than a day, with no effort at all on the part of the Israelites. That's the kind of God that we serve! My friend knew that story already, but as I reminded him of it, I could see that hope was beginning to dawn in him. There are no health problems or financial problems in Heaven, and he is a citizen of Heaven! The Gospel message that gives us hope is that even when it seems like the sun is going down on your situation and things are getting bleak, God will send the salvation you need. Ultimately, the hope of Heaven means that we will spend eternity in the presence of God, but in the shorter term, in this present life, no matter how bad things may look to you, God is very able to make the situation turn out in your favor! So, not too long ago I inherited a cell phone. My wife wanted a snazzy new Android phone, and I wanted to get her one, and I found a company with a nice phone on sale and a dynamite no-contract deal. So she got the new phone, and I inherited her old one; I've never carried a cell phone before, but we were under contract anyway so I decided to just take over her old phone until the contract runs out. So this old phone isn't an Android, and it isn't an iPhone. It isn't a Blackberry or Windows Mobile. This is what they call a "messaging phone," and it can run apps, but they have to be written in the Java language. Java apps are generally pretty simple, and I loaded up some that work and some that didn't, but I really wanted a Bible app, just so I'd have it. YouVersion has a Java app, but because this particular phone is pretty restrictive as far as what you can do and the YouVersion app requires data access to work (plus, I don't have a data plan) I wanted something self-contained. One thing I found out very quickly when I started carrying this phone was something everyone seems to discover right away: a cell phone is almost without fail going to be used as a flashlight sooner or later. One problem for me was that I'm using a sort of dark wallpaper (this one... Buzz FTW!) so I have to pull up the contact list or something with a white background if I want maximum light from the phone. Problem is, some of the screens on the phone time out and the screen dims and then turns off to save power, which means I have to keep pushing a button to get my "flashlight" to come back on. I downloaded a couple of "flashlight" apps, but they don't really have anything to recommend them, and the ones I tried are kind of messy software anyway. But I did find out that when Go Bible is running, the screen never shuts off. Hello, KJV flashlight app!